The demand for electrical power is continuing to grow while the effective use of energy and the maintenance of its supply are the major tasks facing every supplier and user of electrical power. Surveys have shown that the foremost reason for electrical equipment failure is Insufficient Inspection and Proper Maintenance. This is especially true for electrical equipment interruptions which can cause serious economic losses. To help control unscheduled outages, suppliers and users of electrical power are using POWER TECH Electrical Equipment and Maintenance Services. These Services will normally identify problem areas that require immediate attention or changes to establish maintenance programs. Review equipment operating and maintenance records to determine extent of past maintenance work and whether the equipment has been subjected to overload or fault conditions that may require special attention. Develop a work plan with the customer to assure orderly and economic progress of the work. Coordinate work schedules with the customer's assigned personnel and other site personnel. Establish work progress reporting procedures with customers assigned representative. Determine source of expendable materials or replacement parts to be used during inspection program. Review existing safety practices and procedures. A report will be submitted to the customer containing a summary of recommendations and copies of test data. This schedule is intended to cover normal inspection work as outlined. The completed inspection and testing may reveal that repairs are necessary to maintain equipment reliability. The need for specific repairs and the need for correcting deficiencies as found by the POWER TECH Technician will be discussed with the customer's representative. When authorized by the customer, additional work may be performed at rates in effect at the time work is performed and normally applicable to this type of work. Power system components can fail for a variety of reasons. Inadequate testing and/or maintenance, the slow deterioration of metal, damage caused by excessive heat or environmental conditions, and misuse are just a few. Any and all can lead to unscheduled outages. With regular maintenance you can avoid many of these problems, control your costs, and reduce downtime. 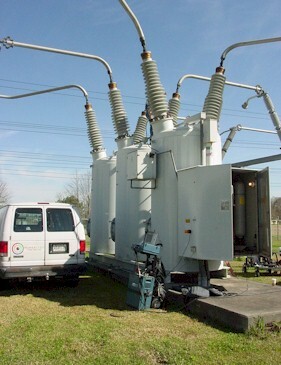 Our factory trained personnel can test and maintain equipment to 230,000 volts. We can identify potential trouble spots - and correct them - before they become serious. Our highly-skilled and dedicated employees are resources that you can count on 24 hours a day, 365 days a year. Backed by our research and Quality Assurance, you can be assured of the highest standard of service. Contact us with any questions.